We at Needtovent didn't think that there was anything in the world thinner than a Republican's lips. Seems the skin of the Barack Obama Campaign Gurus deserves this dubious distinction. 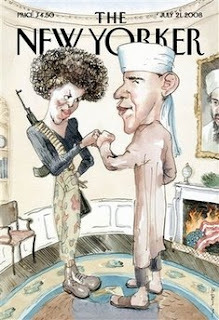 How in the world can these high-ranking advisors possibly condemn as "tasteless and offensive" the cover for the upcoming July 21 issue of THE NEW YORKER? Talk about missing the point, Little Oblio. The purportedly well-educated Obama political machine clearly doesn't understand the meaning of the word "satire." With full realization of what can be read into this final comment, we can only say: "A mind is a terrible thing to waste."